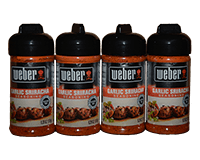 Use Weber® Garlic Sriracha seasoning to add flavor to your chicken, vegetable and seafood recipes. Weber® Garlic Sriracha Seasoning is a blend of garlic and red pepper with a touch of sweetness from sugar and a touch of sour from vinegar that will add excitement to your meals. No MSG. No Artifcial Flavors. No Artificial Preservatives. Ingredients: Salt, Sugar, Garlic, Maltodextrin, Chili Pepper, Red Pepper, Citric Acid, Rice Concentrate, Paprika Extractives (Color), Vinegar, Natural Flavors. Generously rub 1 to 2 tablespoons seasoning over chicken. Place chicken in a shallow rimmed baking dish (line with foil for easier cleanup). Combine butter, honey and 1 teaspoon seasoning in a small bowl. Brush over chicken and bake an additional 15 to 20 minutes until chicken is well browned and internal temperature is at least 170°F.